Yes, we have a No Deposit Office Space Option near Monument! Whilst the below example office space is not specifically a ‘No Deposit’ office, there are a few options in the locale which do provide No Deposit office space terms. 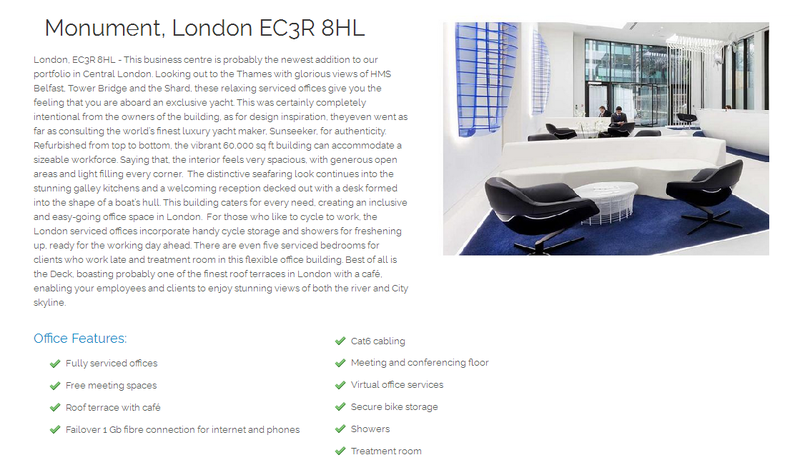 Within a short 10 minute walk of this example Monument office space, we have one such option in EC3V and a second option also very close by on Threadneedle Street. Please note: There aren’t many providers or landlords who currently advertise their space with flexible ‘No Deposit’ or ‘No up front’ terms, so availability of this type of space is scarce and largely undiscovered. Some serviced office providers do however offer No Deposit Licence agreements so for further information on the spaces we have identified for you above, then please click the callback request button at the top of this page or complete the quick enquiry form below and we get back to you just as soon as we possibly can. You can of course call us direct now on 0333 9003344. We look forward to hearing from you.